HOLLYWOOD, CALIF. – (January 7, 2009) Buckle up for a rockin’ ride with Alex, Marty, Melman, Gloria, and the gang in the “hilarious” adventure from DreamWorks Animation SKG, Inc. that’s “even better than the first!” (WWOR-TV) when MADAGASCAR: ESCAPE 2 AFRICA comes in for a landing on DVD and Blu-ray on FRIDAY, February 6, 2009. With twice the laughs, twice the fun and twice the Penguins, the Move It! Move It! Double DVD Pack and Blu-ray are sure to be the talk of the watering hole. 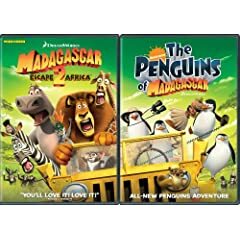 Both versions include the funniest movie of the year and two all-new, never-before-seen animated adventures from Nickelodeon’s brand new series, The Penguins of Madagascar. The series stars four feathered family favorites and King Julian back at the New York zoo where it all started – on a mission… without permission. The Move It! Move It! Double DVD Pack follows on the heels of last November’s release of the successful Kung Fu Panda Pandemonium Pack and offers an exceptional entertainment value for the whole family with an anticipated retail price under $25. Ben Stiller (Tropic Thunder), Chris Rock (Bee Movie), David Schwimmer (“Friends”), Jada Pinkett Smith (The Women), Sacha Baron Cohen (Borat), Cedric the Entertainer (Charlotte’s Web) and Andy Richter (Semi-Pro) return in MADAGASCAR: ESCAPE 2 AFRICA, joined by Alec Baldwin (“30 Rock”) as “Makunga,” will.i.am of the Black Eyed Peas as “Moto Moto,” Bernie Mac (Soul Men) as “Zuba” and Sherri Shepherd (“The View”) as Alex’s mom making their introduction to the watering hole as a brand-new cast of characters. The four zany zoo denizens of the original blockbuster comedy prepare to head home to Manhattan in a rickety aircraft piloted by the ever-inventive penguin cadre. But when they crash land in the African savannah, it’s time for a crash course in survival. Now the four friends far from home must answer a question of the heart when Alex finds his long lost parents (Bernie Mac and Sherri Shepherd), Marty joins a herd of his wild brethren, Gloria finds romance with a hippo Casanova (will.i.am) who appreciates her curves and Melman has one last chance at his truest desire. With King Julien’s manic musical antics, the funniest pack of penguins ever and a pair of primates with opposable thumbs, MADAGASCAR: ESCAPE 2 AFRICA is “great family fun” (WABC-TV). below. Last date for entries is February 12, 2009.